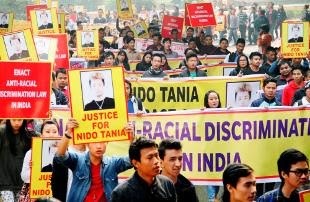 New Delhi, Feb 11 : Several northeastern associations came together with speakers like boxer Shiva Thapa, Tripura Maharaja Pradyot Bikram Manikya and Binalakshmi Nepram to discuss the draft of a strong and comprehensive anti-racism law. The core committee will meet all the MPs from the northeast on Tuesday so that the bill can be presented in Parliament. "This is the first time I was feeling so bad taking a flight to Delhi," said Thapa. He said it was high time a proper law was formulated to protect those who are persecuted on the basis of looks. Demanding a strong anti-racism law in India, the unions blamed the Centre as well as the Delhi government for not looking into the discrimination faced by them. "All governments have failed to protect our people. The elected representatives from northeastern states have done nothing to help people who are discriminated against in the capital," said Bina Lakshmi Nepram, founder of the Manipur Women Gun Survivors Network. They want to include south Indians in the law as they also face discrimination. The speakers pointed out that even India had signed the United Nations' anti-racism treaty. "But they never applied any of it here," said Nepram. The northeast community is upset with chief minister Arvind Kejriwal for not following up after announcing a committee. "Even Kejriwal, instead of acting firmly with the accused in the Nido Tania case, has put the onus on us. He's assured us of investigating the matter which has not been done till now. Where is AAP now?" said Pradyot Bikram Manikya. The latest data by the North East Support Centre and Helpline shows 86% of people from the northeast in the capital have faced discrimination. Founding member Alana Golmei said the Centre should come up with an anti-racism law to insulate people from different forms of harassment. "We are Indians and have the same rights enjoyed by people from other states." The anti-racism law will not just protect people from the northeast but also those living outside their states, she added.